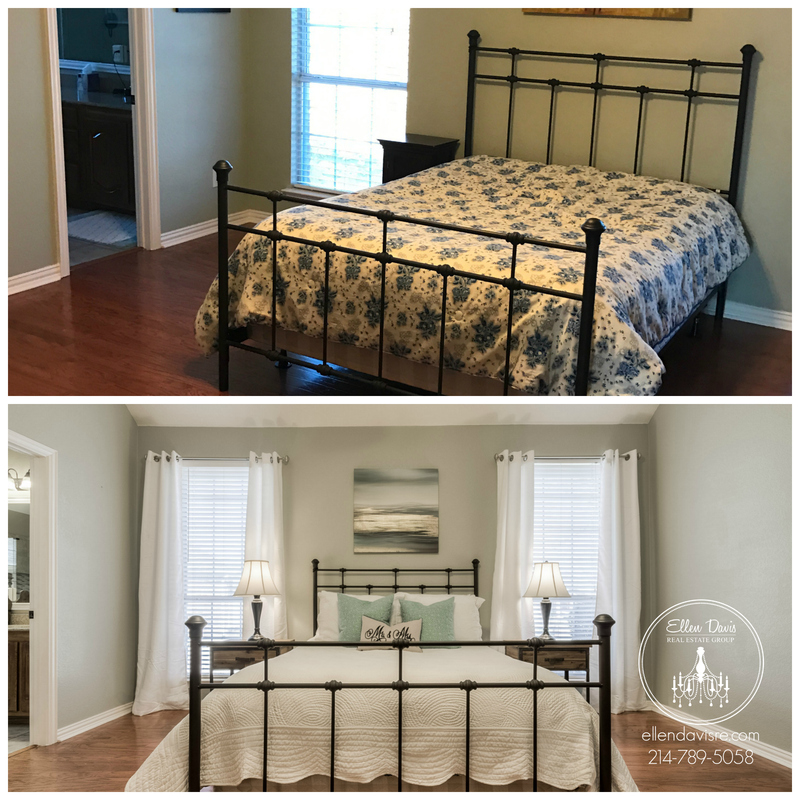 This is one of my very favorite before and after staging bedrooms. It also happens to be one of the easiest to recreate! I have multiple people ask me every week about staging and/or decorating their homes. 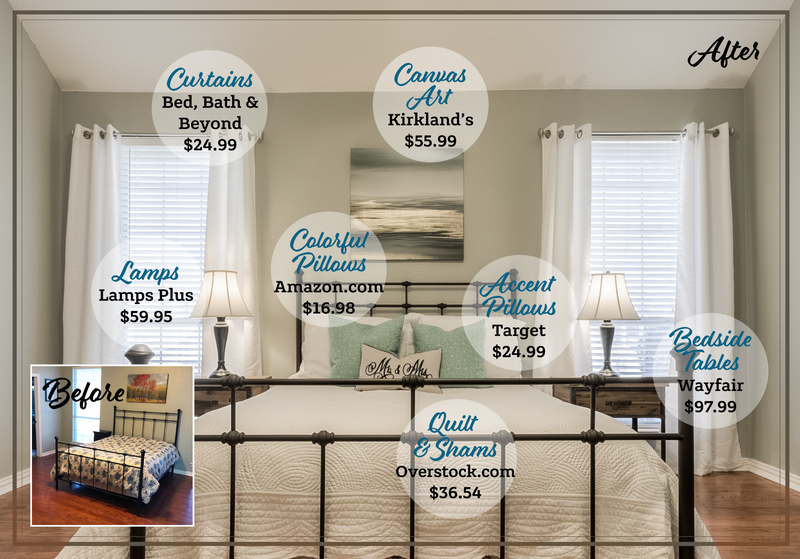 In hopes of helping you re-create this look, I’ve given a sample plan of very similar items to the ones that I used in this bedroom. 1. Add basic white curtains (2 panels per window). The ones in the picture were $24.99 for 2 panels at Home Goods. They are very similar to these curtains currently being sold online at Bed, Bath & Beyond for $24.99 a set. 2. Add crisp white quilt with 2 shams. This quilt on the bed in this picture was $24.99 at TJ Maxx and the matching shams were $12.99 for two. They are very similar to this quilt and sham set currently being sold online at overstock.com, which is currently on sale for $36.54 for the king size set. 3. Add a set of matching lamps. The lamps in the picture were actually from the homeowner’s garage! But I have often found similar lamps at various places for $24.99-$29.99 each. Here is a really nice set of lamps for $59.95 from Lamps Plus. 4. Add a simple canvas above the bed. The canvas in the after picture came from TJ Maxx and was only $39.99. This was definitely a bargain but this canvas art would be a great alternative and is currently on sale for $55.99 from Kirkland’s. 5. Add a few throw pillows to add just a touch of color. The Mr. & Mrs. pillow in this picture came from TJ Maxx but this pillow from Target is really cute and just $24.99. The pillows that add a little more color in the picture are from Home Goods. But these beautiful suede pillows will work nicely with the canvas we specced above and will add just the right amount of color. They are larger pillows – 18” X 18”, which work nicely on a Queen or King Size Bed and are $16.98/each for pillow insert AND cover on Amazon. 6. The most expensive part of this before/after are the side tables from World Market. However, this same look could easily be recreated with an inexpensive garage sale find or this bedside table for $97.99 from Wayfair would look great as well. These simple changes make a basic bedroom just a little more inviting and polished with minimal cost. And as you can see, using the right colors in the decor and finishes can change some of the other harsh colors in the room. In this specific room the white and turquoise color scheme took out a lot of the red tone in the flooring wall color. You can easily recreate your own style using these tips or re-create this exact room using the links above. See the photo below for a more in-depth look at the room before and after. I hope you have found this helpful or at the least interesting! Happy Decorating!